Crisis Management at the Speed of the Internet provides security executives and practitioners with an overview of the potentially harmful impact of social media communication on corporate reputation. Within minutes, the online consumer community can propel a company into an image crisis, brand damage, and a financial disaster-even if the viral information isn't factual. It is critical that an organization respond quickly and decisively to crises in online media. The report explores examples of companies that have experienced this kind of impact, and describes practical, strategic methods for mitigating and resolving a crisis, including cross-functional team readiness and internal communications training. It is a valuable resource for any security professional working to create or improve an existing corporate crisis management policy. 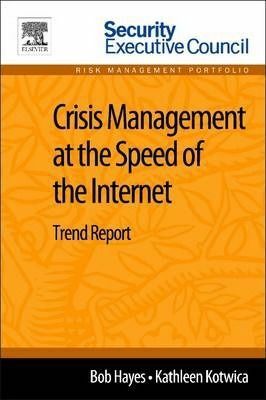 Crisis Management at the Speed of the Internet is a part of Elsevier's Security Executive Council Risk Management Portfolio, a collection of real world solutions and "how-to" guidelines that equip executives, practitioners, and educators with proven information for successful security and risk management programs.